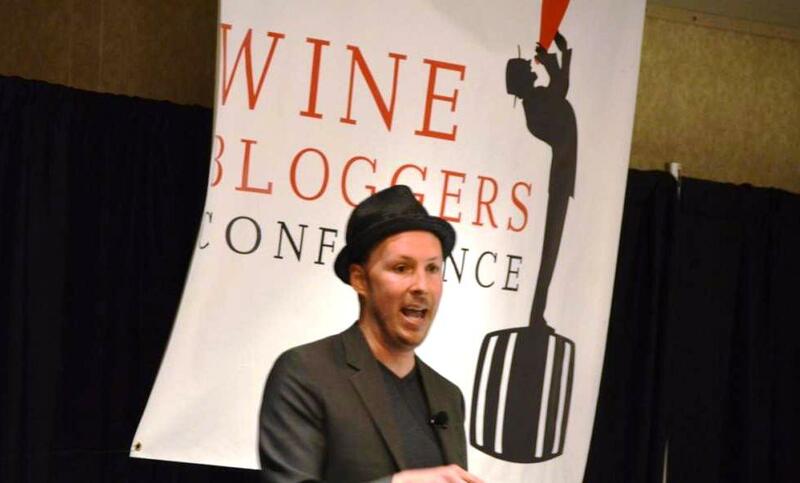 I’m continuing my stories from the Wine Bloggers Conference 2014 (here are the links to the Day 1 and Day 2 posts). The subject of this post is tasting of the wines in the time-constrained scenario, or the Live Wine Blogging sessions (also some attendees called it “speedtasting”). When it comes to the wine tastings of the large scale, I pride myself with being a professional. I’m attending trade wine tasting events for many years, and I don’t have any issues being faced with 300-400 wines in only 3 -4 hours of time. No problems. You use spitton, and you are very decisive about what you want and don’t want to try. I also take pictures and very minimal notes (typically the “+” signs with few descriptors) to designate the wines I like. The Live Wine Blogging Session was yet a very new and different experience. All attendees sit at the round tables. Each table has a number in the middle. Winemakers are ready with their wines and information in hand. As soon as the host says “go”, winemakers approach the tables they are next to, start pouring their wines and talk about them. 4 minutes 30 seconds into this, the host shouts a “30 seconds warning”, and on the 5 minutes mark the next instruction is “winemakers, go to the next table” (next table with the higher number it is). The session lasts for 50 minutes – 10 wines, 5 minutes per wine. This is the “Live Blogging Session” – so the bloggers are expected to share their impressions live in real time as they taste the wines. What do you think about the 5 minutes time allotment for this task? I found it quite challenging. Yes, 5 minutes is more then plenty to figure out if you like the wine or not. But to come up with some reasonable impressions and taste descriptors (don’t think “nice wine” is a good qualifier) and to share them with the world with the 140 characters limit is not a simple task in my opinion. I don’t know how the winemakers felt, but for sure I was exhausted by the end of each 50 minute session. Another feature of this live wine blogging exercise is complete unpredictability – the only known factor is the color of the wine which will be served in the session (White and Rose or Red). The wines come from all over the world, and there are lots of participating wineries, so at every table attendees only get to taste a fraction of the total selection available for the session. The wines also represented a broad range of price points – from $10 simple Washington Riesling to the $125 rare California Cabernet Sauvignon. closed on the palate, Chablis like acidity. needs time! 2011 Scratchpad Chardonnay Central Coast – label and the bottle – creativity through the roof!!! Cat Pee on the nose, yes!!! palate: perfect, fresh, lemongrass, acidity, touch of gooseberries – wow, just a classic!!! fav!! Charles Krug Sauvignon Blanc was definitely my most favorite wine of that session. Aridus Viognier from Arizona was most unique (I don’t get to taste too many wines from Arizona). The “prize” for most creative design goes to the Scratchpad Chardonnay, taking into account both the cool label and a little pencil which hangs of the bottle top – unfortunately, the taste didn’t fully support the creativity of the bottle. 2006 Jordan Winery Cabernet Sauvignon – beautiful nose, open fruit, touch of earthiness, cassis, the same on the palate. Perfect Cab! The red wines line up was very impressive, it is hard to pick the favorite. The Adealida Touriga Nacional from Paso Robles was probably the most unusual (my first 100% Touriga Nacional wine from US), and very tasty. Jordan is always a stand out for me, and both 2006 and 2010 were delicious. My wine of the day was still the Vineyard 511 – a rare treat from the Diamond Mountain district (tiny area of 500 acres in size) in Napa Valley, perfectly structured and impeccably balanced wine; the conversation with Ed and Irene Ojdana who makes the Vineyard 511 Cabernet Sauvignon was a pleasure in itself. I also have to mention Taken Red wine from Napa Valley, which was simply put on our table after the session concluded – this was an excellent wine, created by Carlo Trinchero and Josh Phelps, both coming from the very well respected winemakinig families in California. 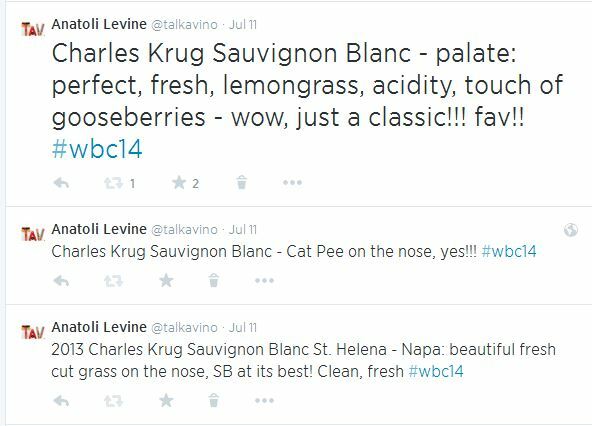 Here we are – two speedtasting, live wine blogging sessions. I know that this exercise is very polarizing for many attendees – some hate it, and some love it. I’m in the latter category, and I definitely enjoyed the sessions and already looking forward to the repeat at the next year’s conference. What do you think – would you love it or hate it? Cheers! 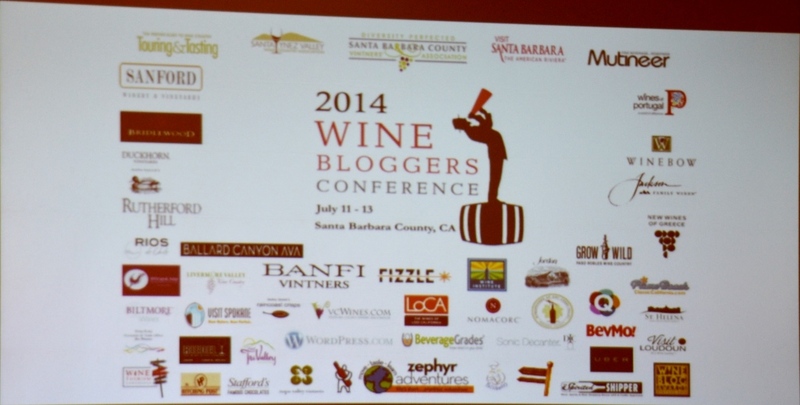 Friday was the first full day of Wine Bloggers Conference 2014 (WBC). My impressions in a few words? Overwhelmed. Is there a word for “more than overwhelmed”? The pace of learning, connecting, tasting, analyzing, networking, mingling and tasting more, more and more was incredible. Here is what was happening throughout the day – brunch (yep, a 10 AM brunch) with Portuguese wines and dishes from Brazil, India, Japan and Portugal – 11 wines and 12 different dishes. Then the opening of the conference and a keynote by Corbett Barr. 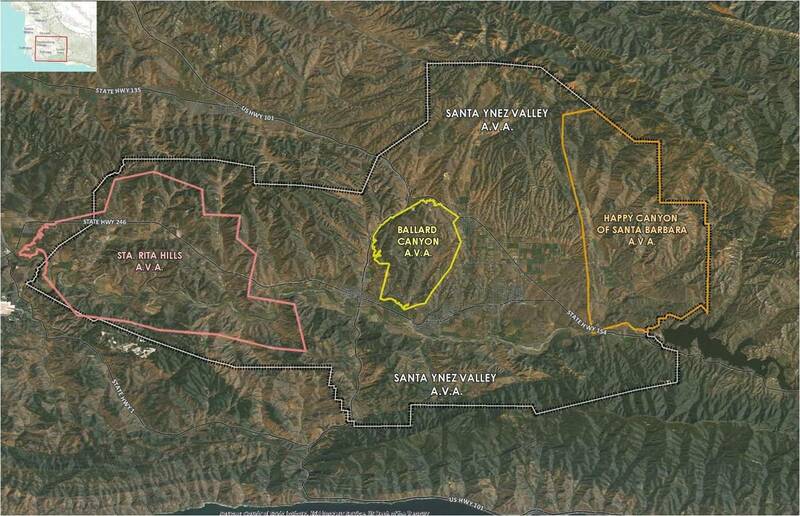 A panel session with Santa Barbara County winemakers (rather founding fathers of the winemaking in Santa Barbara). Speed tasting of the 10 white wines in 50 minutes (very intense). A breakout session called “How The Pros Taste”, which included both the Pros and the wines. An excursion to the mystery destination (yes, with more wines). The Wine Tourism in North America Expo (yep, with more wines to taste), an unofficial before-party in one of the hotel suites before the actual official after-party, and then finally (oh yes, the best for last! ), an official after-party, hosted by Jordan and J Wineries. So, how is that for a day for you? Pretty full schedule, huh? I will leave speed tasting and our mystery excursion for the separate posts, but for the rest of the program, here are my quick impressions. Brunch with Portuguese food and wine was the very first in our day’s program. As I wrote a few times about Portuguese food and wines before, I would definitely agree that both Portuguese wines and cuisine are well worth the attention. At the brunch, we had an opportunity to experience 11 different wines (both white and red), as well as 12 different dishes. If you take a historic perspective on Portugal, hundreds of years ago, Portuguese influence was spread all over the world. To show that world-wide influence, the dishes in the brunch we coming from the different regions which came into a close encounter with Portuguese culture – namely, the dishes from Brasil, India, Japan and Portugal itself (of course!) were part of our brunch. I will not inundate you with all the details of the dishes and wines (despite taking the detailed notes) – I just want to mention two of my favorite wines. For the whites, 2012 Julia Kemper Branco Dão DOP was delicious, with touch of grass and flowers, very interesting nose, light and simple on the palate. As an added bonus, this wine also added one more rare grape to my collection, Encruzado. From the reds, 2010 Quinta do Romeu Colheita Douro Tinto was my favorite, with very nice dark fruit, medium body, open and round, and good balance. And for the rest of it – here are the pictures of the wines and dishes. Character Trumps Credentials – your passion is more important than many technical accolades and certifications you can achieve. Yes, the certifications are important, but it is passion, will and tenacity which will be a foundation of your success. Be different. Stand out. Don’t blend in. Yes, you have to find your own way, don’t be “one of many”. Find what works. Don’t repeat exact same thing over and over again, expecting that magically what was not working 100 times, will work on 101st. If something doesn’t work, looks for what will – but keep going. Hope is not a marketing strategy. Find where your readers are and figure out how to get in front of them. Your blog is not your business. Understand what your business is. The blog is just a tool to help your business, but not the business by itself. Keep going, constantly evolving. If you will continue looking for what works and improve all the time, you will [almost magically] leapfrog at some point to your success. Mastermind 101 – “You are the average of the five people you spend the most time with” – Jim Rohn. Talk to the people who “get it”. If you will talk to “achievers”, you will [at some point] becoe one yourself. This is a very lose approximation of what Corbett Barr had to say, but I hope I was able to give you at least the basic idea. And for more information, head over to his web site and read, read, read. Our day continued with the panel session of Santa Barbara winemakers. Session was moderated by Larry Shafer, the winemaker behind the Tercero label, and it brought together the people who were instrumental in starting and growing Santa Barbara wine industry – Richard Sanford, Ken Brown, Rick Longoria and Bob Lindquist. 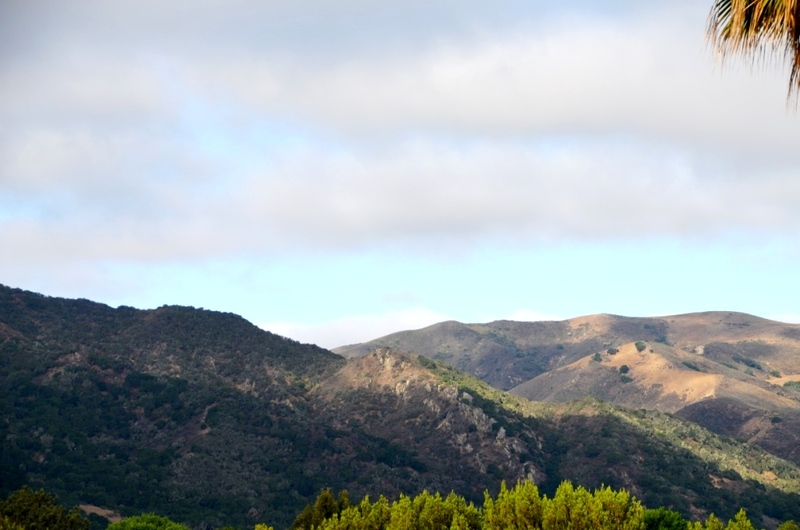 We learned about the Santa Barbara wine region which started in 1968 with the Santa Barbara Winery, and had grown into the prominent producer of Pinot Noir and Rhone-style wines. 40 different grape varieties are growing today in Santa Barbara area, and a lot of Santa Barbara grapes are shipped to Paso Robles and Napa and used in the coastal blends. Passion, friendship and love to the beautiful Santa Barbara wine region is something which was clearly showing through the words of all the winemakers. Our next session was the speed tasting of white wines and Rose, which I will be talking about separately – I can only tell you that it was a fun exercise. You know what else is great about the wine bloggers conference? You get to taste the wines which are not necessarily are even yet available to the general public. Case in point – a unique Viognier, Marsanne, Roussane blend from … Argentina – 2012 Hand of God Fingerprint Series Sobremesa Vineyard VRM White Blend. The wine is in the process of being brought to the United States, and nevertheless we had an opportunity to taste this aromatic, big and well structured white wine, which was simply poured by the winemaker while we were walking from one session to another. The last session of the day was a so called breakout session, where we had to chose between three different sessions running in parallel in the different rooms. I decided to go and learn “How the Pros Taste”. This session was a panel discussion led by Steve Heimoff, the wine writer who is now the Director of PR for Jackson Family wines, Joe Roberts, a.k.a. 1 Wine Dude, and Patrick Comiskey, senior editor for Wine & Spirits magazine. 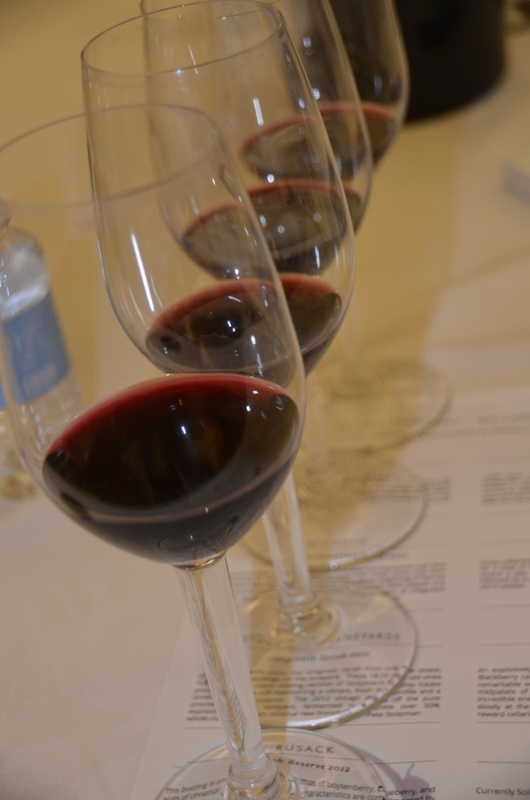 The idea of the panel was to discuss the ways of the professionals tasting tens of thousands of wines every year, and issues they are facing – and I think the panel did the fine job with issues and challenges. Talking about the “ways” was a bit less successful – I would expect the panelists to explain more of a “how to”, their methods for assessing the wines in the mass quantities – which didn’t take place. And then we tasted 4 wines, 3 of which we selected by the panelists, and one “double blind”, unknown even to the panelists. The selected wines were supposed to represent the unique view point of each panelist, the wines which are “best of the breed” and emotionally engaging. Considering that, I would highly question the rationale of including very obscure wines in this “representative” tasting, but this is mostly what happened. The 2012 Yves Leccia Patrimonio Blanc, a Vermentino wine from Corsica, had nothing but the acidity and didn’t speak to me at all. It didn’t create nor demonstrated any emotional connection. 2013 Poet’s Leap Riesling Washington, while might be typical for Washington, didn’t deliver much pleasure either, and it didn’t connect with the Washington Rieslings as I know them from the Chateau St. Michelle or Snoqualme. Again, I would highly question inclusion of such a wine as “exemplary”. The red wines fared a lot better. 2011 Cambria Clone 4 Pinot Noir Santa Maria Valley was quintessentially Californian, with beautiful nose of smoked cherries, exemplary palate full of forest floor, gentle fruit and perfect balance. Our double-blind wine surprised everybody, including the esteemed panel – clean cherries and acidity were pointing in the direction of Montepulciano from Italy, and the wine happened to be an Yangarra Grenache McLaren Vale from Australia – but it was a very tasty wine. All in all, this was an interesting session, but I would like to see it done differently, more focused on classic methods and classic wines (definitely for the whites). And then we had a mystery bus excursion. I will keep it a mystery until the next post (trust me, it was good enough for the separate post). When we came back in the evening, we still faced … yes, you guessed it – more wine! The Wine Tourism Throughout North America expo was focused mostly on California wines (or may be I was too tired to notice anything else). I tried a few wines, out of which 2010 Mad Hatter Napa Valley was clearly a stand out – dense and concentrated, with layered fruit, it had a lot of dark power (similar to its color), very drinkable now, but holding also a great promise to evolve. This wine was made by the famed Andy Ericsson (Screaming Eagle, Harlan, Favia and many others). Few other interesting wines were 2007 Terra Valentine Spring Mountain District Cabernet Sauvignon Napa Valley, very clean and classic. 2011 Steven Kent Vinery Cabernet Franc Livermore Valley was perfectly on the mark with beautiful cassis undertones, and 2012 Vasco Urbano “Norm” Grenache Livermore Valley was luscious and delicate, with nice fresh fruit on the nose and the palate. The “before-Party” for after party was generously hosted by Banfi folks in one of the hotel suites, and the highlights were mostly Italian wines with the few of the wines from Washington state. The 2013 Pacific Rim Chenin Blanc Yakima Valley was perfectly balanced and had an excellent fresh white fruit, a bit of mineral notes and rounding acidity. The Sartori di Verona Ferdi Bianco Veronese IGT was very unique and unusual, an Amarone-style wine (100% Garganega grapes, dried for 40 days on straw mats), with big fruit notes, full body and somewhat sharp acidity. And last, but not least – an offical after-party, hosted by J Vineyards and Jordan! Both J and Jordan are some of my favorite wines in general, and what a treat it was! Probably unsurprisingly, I was a bit tired after such a day, so I didn’t take too many pictures. But the wines were outstanding. J were pouring both of their sparklers, the White and Rose, as well as the Pinot Noir. 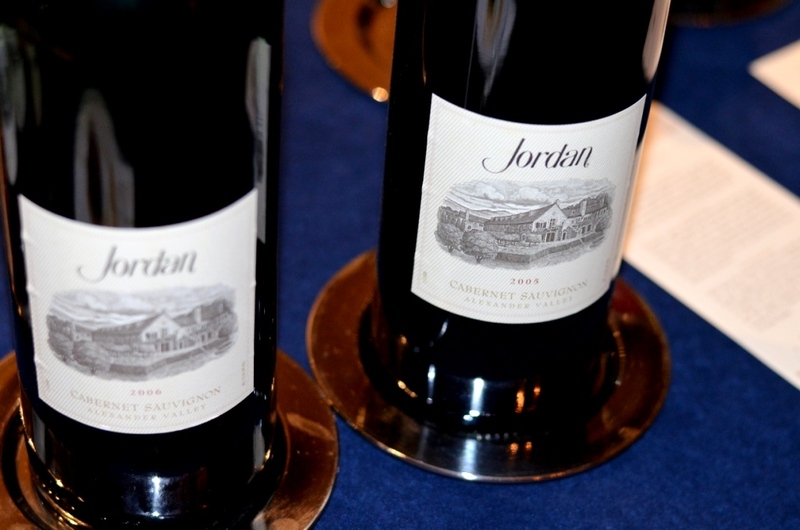 And Jordan… How about a full vertical of the Jordan Cabernet Sauvignon Alexander Valley from 2002 until the 2008, including 2005 and 2006 in both 750 and magnum sizes! All the wines, including 2002, tasted fresh and delicious – again, no detailed notes (if you want to blame me for the luck of attention, be my guest). I was especially happy to see that 2002 showing absolutely no signs of age, and 2005 being delicious with still powerful tannins – I have a few bottles of 2005 in the fridge and it seems that I have no reason to touch the for a good while. For what it worth, this was an attempt to give you an idea of the happenings in the first day of Wine Bloggers Conference (two more posts will be coming). Hope you are still reading this, and if you are, I want to thank you for your patience. Just one question, if I may – after reading this post, did it make you want to come to the #WBC15, or stay away from it as far as possible? Let me know! Cheers! P.S. For some reason, this was one of the most difficult posts I ever wrote for this blog… But I’m glad I finished it.